Before getting into job openings, let's review the Redbook. In the week of April 6th, Redbook yearly same store sales growth improved from 4.4% to 4.8%. That’s obviously good news. But keep in mind, last week the Redbook same store sales growth rate fell from 5.3%. The timing of Easter could be interesting as the late Easter hurt late March/early April sales, but will help late April sales. Even if data is seasonally adjusted, the alteration isn’t always accurate. As you can see from the chart below, the high sales growth rate at discount stores has pushed Redbook’s results higher than other retail sales metrics. The font is small, so I will review what each line means. The green line measures Redbook’s yearly discount store sales growth calculation. It is much higher than the rest of the metrics. It’s not ideal to have discount store sales doing amazingly since consumers flock to those stores when their budgets are tight. The orange line shows Redbook yearly sales growth in department stores. It is negative. Department stores are losing share to online stores. But it’s still not great to see negative growth. The light blue line shows Redbook sales growth and the blue green line shows Goldman’s chain store sales growth calculation. Goldman’s estimate is lower. Goldman calculation isn’t the ultimate arbiter of retail sales (the government’s report is the truth), but it gives context to the unusually strong Redbook results. 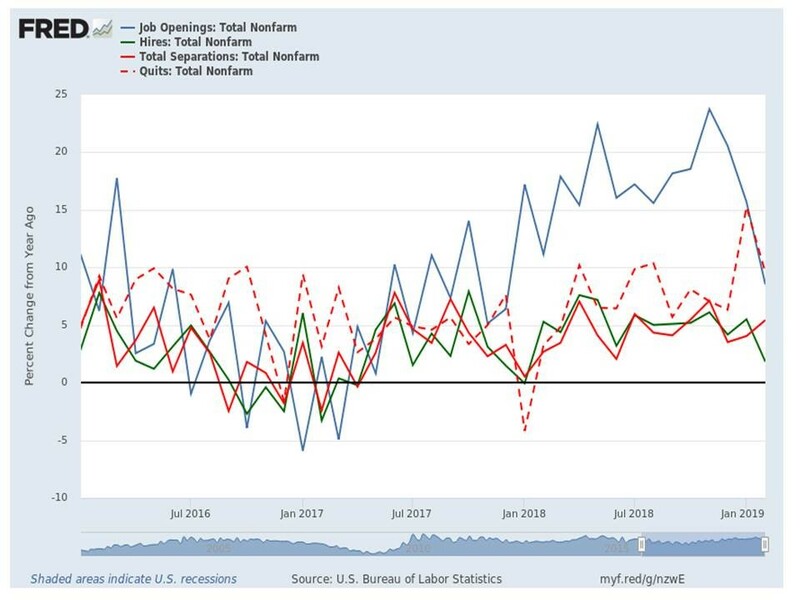 Because the BLS report showed only 33,000 jobs were created in February, I wasn’t shocked when the February JOLTS report showed a decline in job openings. Specifically, the number of openings fell from 7.625 million to 7.087 million. Economists didn’t get the memo that the labor market was weak in February as openings were expected to be 7.565 million. This report missed the low end of the range which was 7.1 million. As you can see from the chart below, yearly growth in openings, hires, and quits fell. Growth in separations increased. With this report being sequentially negative, that means most labor reports were weak in February. Challenger Job-Cuts report was also elevated. Only jobless claims were solid in February, although there was a slight increase. Since the BLS report improved in March, I expect JOLTS to do the same. Hiring fell 2.3% monthly to 5.696 million. The difference between openings and hires fell more than 400,000 to 1.391 million. That’s a good thing happening for a bad reason. We want to see that gap shrink, but it would be better if hiring increased rather than job openings decreasing. This is like if the unemployment rate fell because people dropped out of the labor force. Total quits were steady at 3.48 million. When quits spike, it will signal there is a high amount of worker mobility and a breakout in wage growth. Since we haven’t seen a surge yet, you can say wage growth hasn’t had its final cyclical burst higher. We could see a burst in quits and nominal wage growth when the prime age labor force participation rate reaches last cycle’s peak. This labor market doesn’t imply the Fed should be hiking rates. The Fed is correct to pause rate hikes this year. 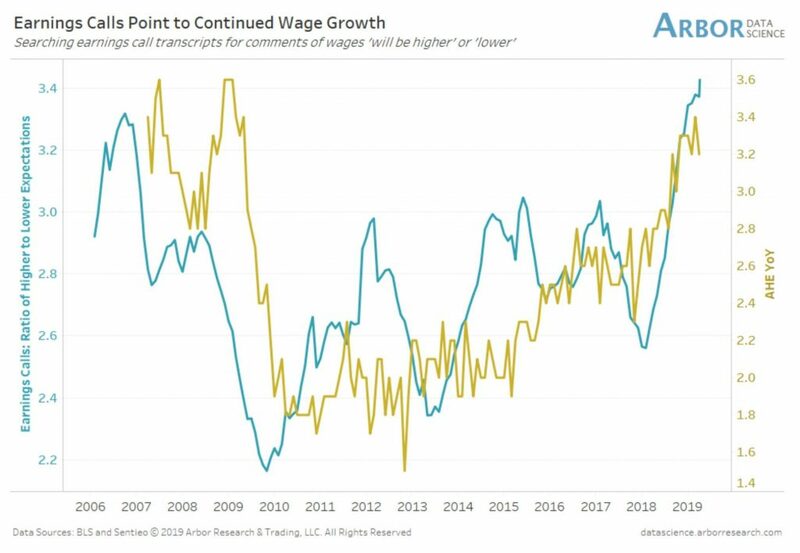 The chart below compares average hourly earnings growth with the ratio of earnings call comments where firms say wages will be higher to the number of times firms say wages will fall. Charts with duel Y-axes can be misleading because it is easy to fit both lines. However, it’s still worth noting the spike in the percentage of firms saying wages will increase versus the recent down draft in hourly earnings growth. Weekly earnings growth increased in March, but it has been range bound for over one year. It’s possible that we will see wage growth follow the earnings transcript ratio. Increased openings and hirings will be paramount to a re-acceleration in hourly wage growth. We might need to wait until late 2019 for that to occur since economic growth could rebound then. The delay in the wage growth spike is great for business’ margins especially those in labor intensive industries. University of Michigan’s March consumer confidence reading was strong. But the Conference Board’s index fell. It’s weird to see confidence fall because the stock market is up and job creation rebounded in March according to the BLS report. NFIB small business confidence index can be thought of as a tie breaker. In March, the index increased very slightly from 101.7 to 101.8 which beat the consensus by one tick. 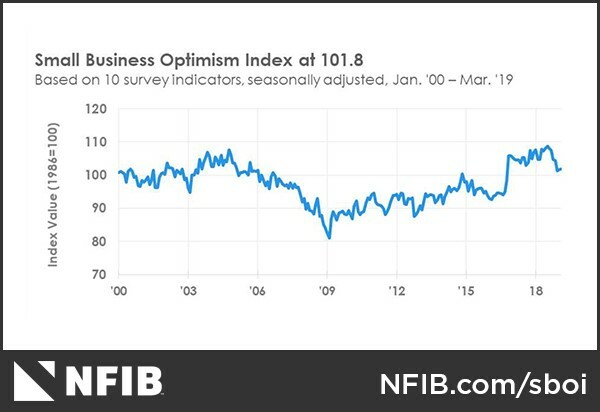 As the chart below shows, small business confidence is relatively high, but below the heights reached in 2018. It was in between 105 and 110 last year. 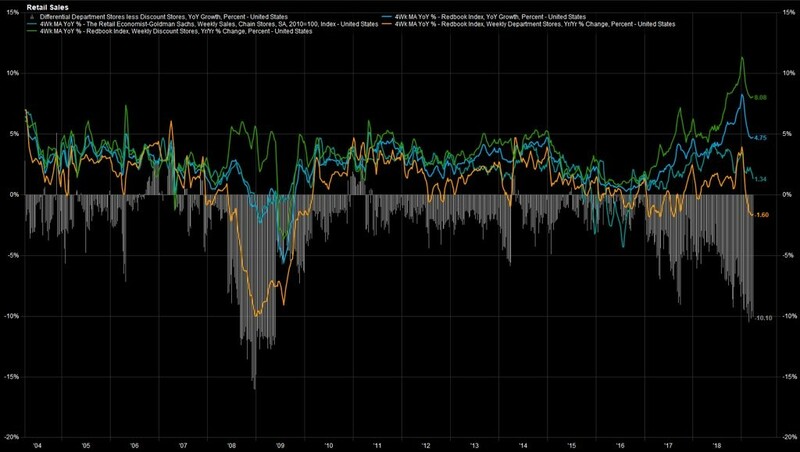 Looking at the individual indexes, the worst category was the net change in current inventories which fell 4 points to -6%. The other 2 categories that fell were the net percentage of firms planning to increase inventories and the net percentage of firms expecting credit conditions to improve. Both fell 2 points to -1% and -7%. 4 indicators increased which is why there was a slight increase in the overall reading. The biggest increases were in current job openings and plans to increase employment. They were both up 2 points to 39% and 18%. It’s good to see the labor market improving, not that this indicator showed the labor market was weak in February. In this article, we have an improved Redbook report, which might have been caused by discount stores, a weak JOLTS report, which should rebound in March since the BLS report showed improvement, and a strong NFIB small business confidence indicator. If this is as bad as some of the data is going to get, this isn’t that terrible of an economic slowdown. So far, it has been a mini-slowdown. I’m still waiting for the reports to get really bad in Q2 and Q3 based on what the ECRI leading index predicted.